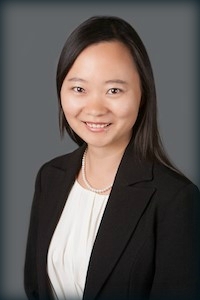 Staff Spotlight: Associate Attorney Yingfei Zhou, Esq. It is our pleasure to introduce our readers to Associate Attorney Yingfei Zhou, Esq who joined our firm in 2012. Attorney Zhou is an active member of the California State Bar, the New York State Bar, and the American Immigration Lawyers Association (AILA). Ms. Zhou practices primarily on employment-based and investment-based immigration law. Ms. Zhou has experience in various aspects of business immigration, including employment-based permanent residence and nonimmigrant visas, as well as marriage-based immigration and citizenship matters. Specifically, she has provided counsel to clients in relation to employment in specialty occupation, nonimmigrant NAFTA professional visa, individuals with extraordinary ability and achievements, nonimmigrant trainee or special education exchange visitor visa, religious worker visa, E-2 treaty investor visa, waivers, applications for adjustment of status, employment certification (PERM) applications, motion to reopen/reconsider, re-entry permit, visa interviews, as well as extensive EB-5 investment immigration work. Want to schedule an appointment? Please contact our office by clicking here.